“Karuna Hum. I open my consciousness to universal love and compassion." 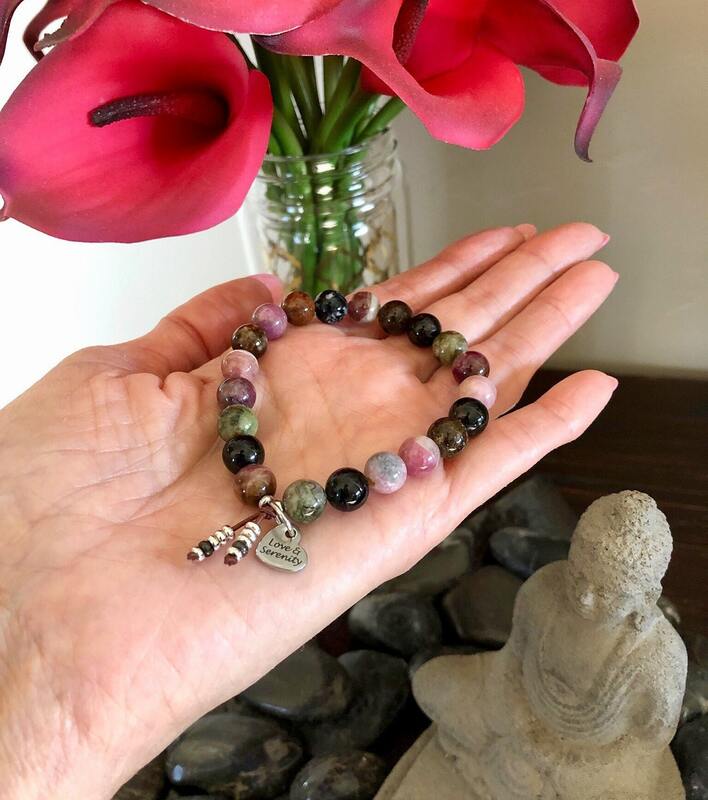 The Love & Serenity Mala Bracelet features beautiful multi color rainbow Tourmaline gemstones along with a stainless steel (anti-tarnish) reversible heart charm to clear your energy field and provide soothing love, peace and comfort. 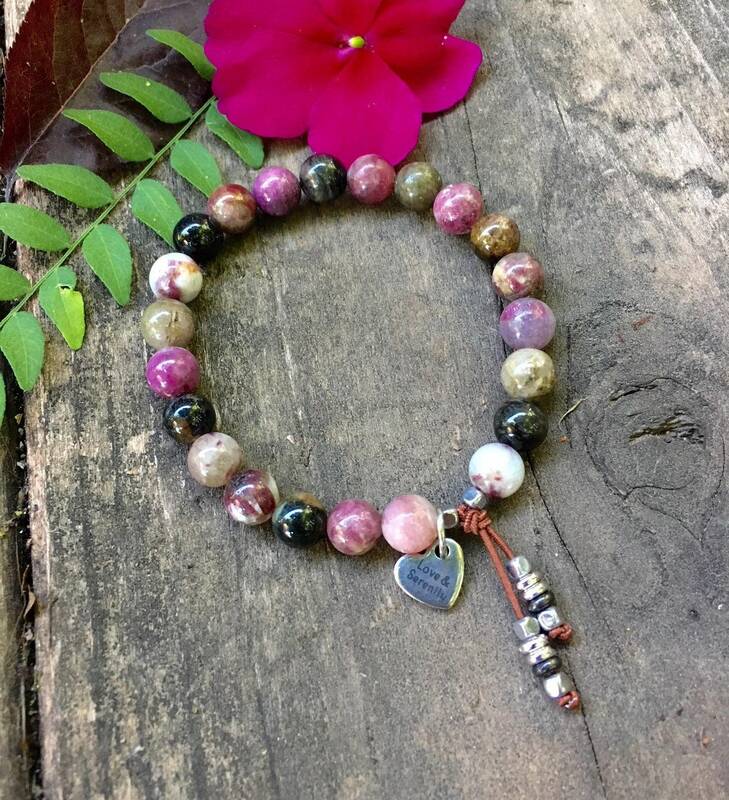 *Since each Tourmaline bead is unique, with different colors and characteristics, every Love & Serenity Bracelet will have a slightly different overall appearance. All gems are carefully hand selected to create the perfect finished product. 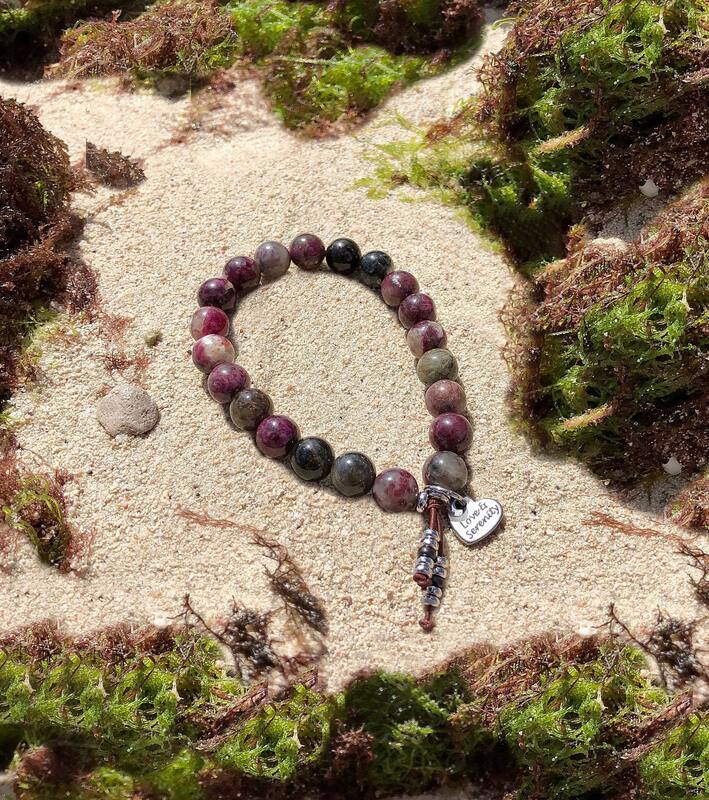 No two Love & Serenity Bracelets are alike. *The adorable heart charm is lightly engraved with the words "Love & Serenity" on both sides. Tourmaline is known as the "gem of the rainbow" because it comes in so many beautiful colors. It is widely known as a detox gemstone as it cleanses and purifies heavy, dense energy into lighter vibrational energy. 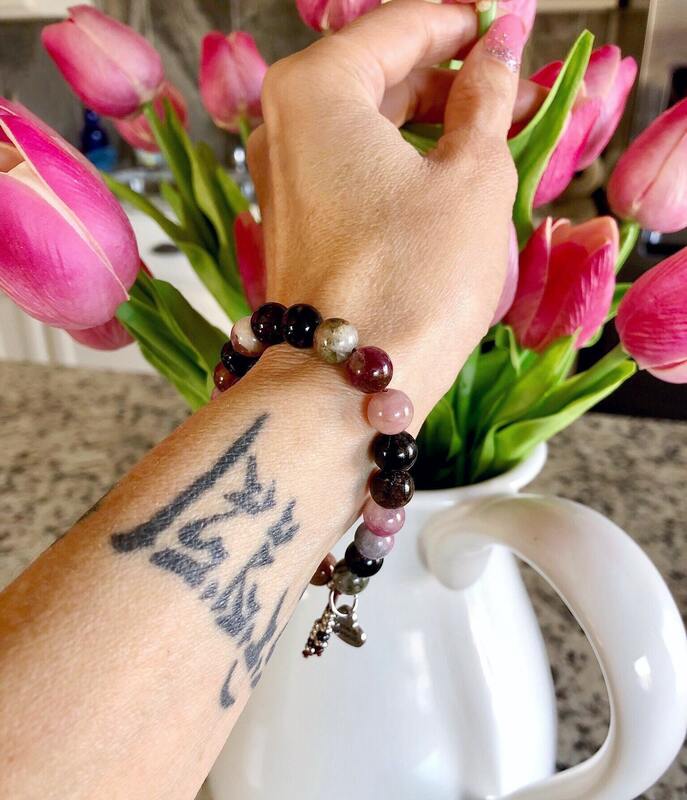 Tourmaline clears and balances all the chakras and forms a protective shield around the body. It is also known to enhance energy flow, remove blockages and balance sexual energy. Tourmaline awakens self love and attract romantic love. Every color offers a unique healing vibration. Green tourmaline is balancing, pink attracts love, watermelon instills patience, blue brings clarity, brown clears the aura, purple stimulates intuition, yellow enhances personal power and black protects against negativity. When worn together, they bring the mind, body, spirit and soul into wholeness and provide a gateway into the inner self and higher spiritual realms. My bracelet is really beautiful and it will complement another piece of tourmaline jewelry I wear. Brenda responded quickly to my inquiry. She shipped my order very quickly. The packing or presentation of the bracelet was also very pretty. As always I received this bracelet so fast! It is completely gorgeous and fits perfectly. The strength I feel from this bracelet is truly powerful. The days I don't wear it (which are rare) I can really notice its absence. 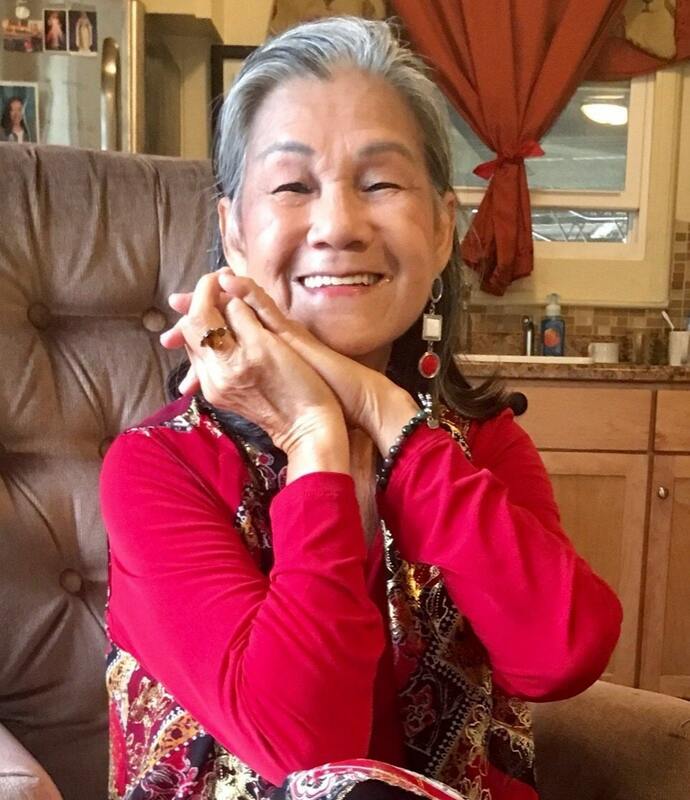 The energy has made a huge difference in my life and it's just what I needed!